Being in Berlin has its perks. One is the incredible museums. 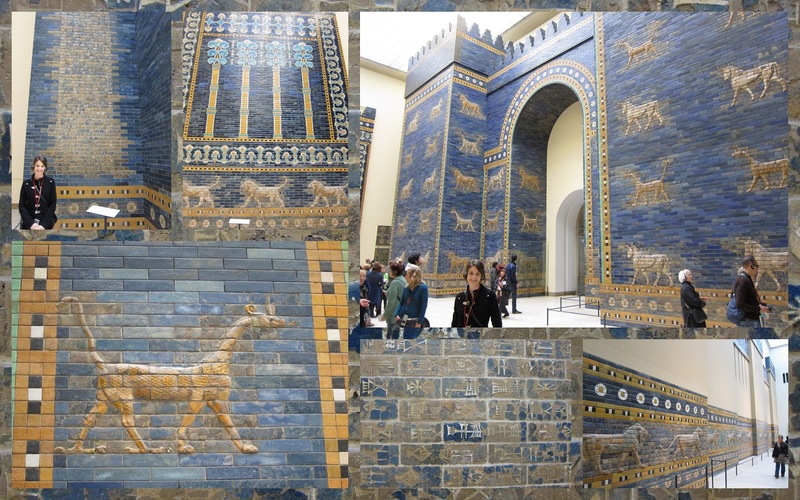 Last week we took an afternoon and went to see the Pergamonmuseum. Most of the artifacts were taken from Turkey in the 1800s. That is what the West did. And it isn't even that Germany was terribly interested in the artifacts. The Prussians just looked around and saw great big museums in Paris and London and didn't want to be left behind. I think they 'caught up' pretty well. As you walk into the first "exhibit" you find yourself at the foot of an ancient Greek Altar—The Pergamon Altar, or Altar to Zeus. While much of it is reconstructed, all the friezes are the orignal. They depict the epic battle between the gods and the giants. The friezes wrap the entire room, and are only a portion of the original. Larger than life humans, with stone flesh, wresting with ani-morphs and crumbling. The next spectacular artifact was the Market Gate of Melitus, one of the best preserved and complete architectural elements from the Greek Period. I am thinking later Greek because of the capitals' very intricate patterns and designs. These are stones that Christ could have walked by! So, let's go a little but further back in time. Walk through the Gate of Melitus, and emerge in Ancient Babylon. 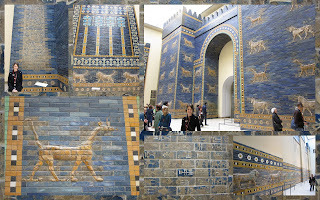 This is the Ishtar Gate of Nebuchadnezzar II. Actually, it is the smaller portion of the gate. While parts are reproductions of the gate, many of the tiles are the originals. The animals and cuneiform script are the real thing. I usually think of artifacts, museums, etc as being beautiful, but monochromatic. Objects do, after all, loose their pigment over time. This gate is brilliant deep blue and bright yellow. The tiles catch the light. It was spectacular. The rest of the museum is full of Ancient Middle Eastern artifacts, and then another level of Islamic Art. The scope covers the Middle East from before the Hittites to this century. There is certainly a maturity and depth in this art that has grown and developed with culture, religion and time. I loved reading this. Hope the pictures show up soon. A little note on the side says "we were unable to handle your request" Bummer. I didn't get the pictures either. But they sound wonderful. So glad the photos are displaying correctly - those tiles are just gorgeous. Blue is a great colour, isn't it? 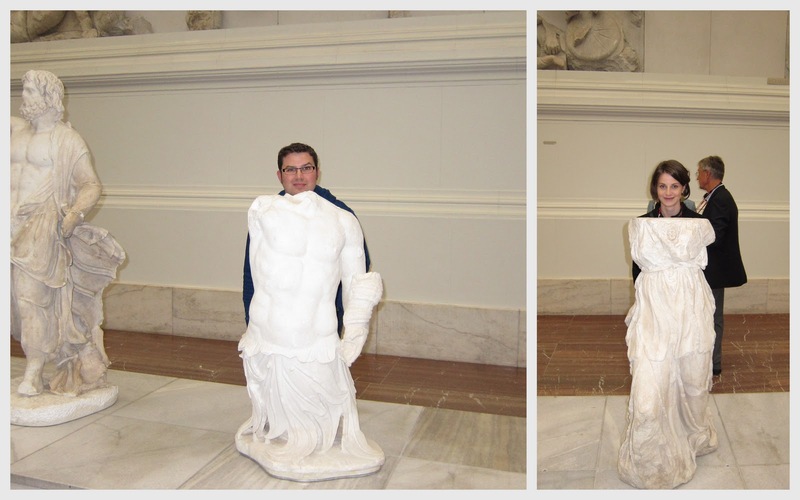 I think you and Owen look wonderful as Greeks, but best as Canadians.